J. Aaboe, H. Bliddal, S.P. Messier, T. Alkjær, M. Henriksen. 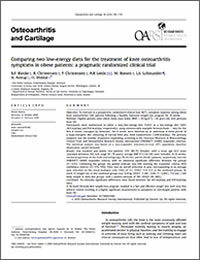 1063-4584/$ @2011 Published by Elsevier Ltd on behalf of Osteoarthritis Research Society International. doi:10.1016/j.joca.2011.03.006. Effects of an intensive weight loss program on knee joint loading in obese adults with knee osteoarthritis.